England World Cup striker: Should Vardy eclipse Kane as number nine? When Gareth Southgate named his 23-man England World Cup squad, there was little surprise in the strikers that were chosen. However, despite the inclusions of Jamie Vardy, Marcus Rashford and Danny Welbeck, few of the football-supporting nation will be betting against Harry Kane leading the England line in Russia. Southgate’s decision to appoint Kane as the England World Cup captain only furthers the assertion that the Spurs striker will start the Three Lions’ Group G opener with Tunisia on Monday 18th June. The Tunisia v England betting odds has England positioned as the 3/10 favourites for victory. Based on Southgate’s team selections since taking over as manager, it’s pretty clear that England’s go-to starting formation at the World Cup will be a variation of a 3-5-2. Yet, rather than Vardy, Rashford or Welbeck, Raheem Sterling is expected to be Kane’s strike partner. His role will be to drop deeper to link play, receive the ball into feet and to run at opposing defenders. Vardy and Rashford are joint fourth in the top England tournament scorer market at 8/1, behind Kane, Sterling and Dele Alli. However, there are grounds to believe that the Leicester striker should be a bigger contender for a more regular starting berth. And it’s not that outrageous to suggest that it’s Kane who Vardy should be replacing as England’s World Cup number nine. Below are some areas where Vardy not only betters Kane, but where he could also be more valuable in Russia. England will play a maximum of seven matches if they are to lift the World Cup for the first time since 1966. Of the five England World Cup forwards, Vardy was comfortably the most clinical in front of goal during the latest Premier League season. Here are how his numbers compare to Kane when it comes to reliability in front of goal. Only Arsenal’s Pierre-Emerick Aubameyang had a better conversion rate among forwards who netted more than a single top-flight goal all season. The Gabon striker’s 10 goals came from only 31 attempts. Not only does Vardy take more of the opportunities he’s presented with, he’s also more likely to work the opposing goalkeeper. This obviously could lead to teammates scoring rebounds or corners to generate another scoring chance from. In terms of league minutes and fixtures this season, there is little to split Kane and Vardy. 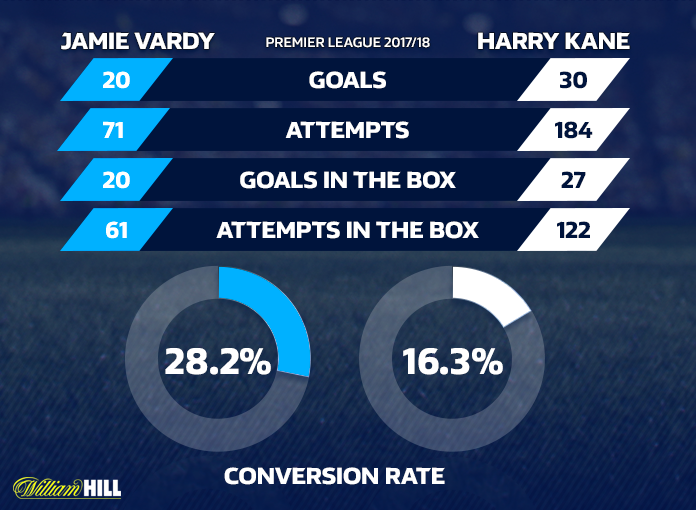 Both featured in 37 of their club’s respective 38 Premier League games and no other strikers could trump the pair in terms of time on the pitch – Vardy played 3,255 minutes, compared with 3,083 for Kane. Therefore, each can clearly handle the responsibility and pressure of being the main man. If the England World Cup squad is to win the tournament, they’re undoubtedly going to have to beat some of the world’s elite on the way. All games are huge at the World Cup, but showdowns with the likes of Brazil, Germany and Spain should theoretically be much tougher to win than those against opposition such as Mexico, Sweden or Poland. Not only has Vardy been more clinical than Kane in the past 12 months in domestic football, he has also excelled in the biggest fixtures. Against the recognised ‘Big Six’ of Manchester City, Manchester United, Tottenham, Liverpool, Chelsea and Arsenal this term, the Leicester hitman registered 11 goals in 12 league outings. This record improves to 13 in 14 in fixtures across all competitions. Kane obviously never faced Tottenham, but his scoring record was only four in 10 against the other five clubs in league and cup action. Looking back across the last three seasons, Kane averages worse than a goal every two games against these clubs. Meanwhile, Vardy has scored 27 in 40 matches. What’s more, of the 28 Spurs matches that the England skipper netted a brace or better in since start of the 2015/16 campaign, only one came against ‘Big Six’ opposition – in the 4-1 triumph over Liverpool at Wembley this season. Vardy has registered four braces against the same opponents and a hat-trick – in Leicester’s 4-2 triumph over Pep Guardiola’s Man City during the 2016/17 season. Southgate has clearly looked to implement a more possession-based game than his England predecessors since taking charge, encouraging players to take more risks on the ball. This playing identity is likely to be effective in the Group G encounters with Tunisia and Panama, with Kane as the spearhead of the attack suited to these fixtures. He’ll be more of a target man to work the ball into against deeper, packed defences and a greater aerial threat should England have to rely on crosses into the box. However, when England may have to play second fiddle in terms of possession, potentially to Belgium in their final group game and possibly the elite previously mentioned, Vardy’s attributes could be more effective. Leicester won a Premier League by hitting teams successfully on the break, averaging only 43 per cent possession in matches throughout the season. This was 15 per cent lower on average than the former winners to this point. A critical component was Vardy’s pace on the break, where he was constantly an outlet with plenty of space to run into. Especially as the World Cup wears on, Vardy’s threat in behind teams that like to defend high and press up the pitch could be vital. There’s also the option of the pair playing together for England at the World Cup, either with Vardy replacing Sterling in the expected 3-5-2, or the pair both flanking Kane in more of a 3-4-3 set-up. Only Roberto Firmino touched the ball more frequently in the final third among Premier League strikers this term than Kane, while he ranked third for passes received in the same segment of the pitch. Given that he’s also prone to shooting from anywhere, backed up by the fact he had as good as twice as many shots as any other striker this season, it’s arguable that he could perform as a support striker. Many will conclude that England’s World Cup prospects predominantly rest on Kane’s shoulders and whether he can score enough goals to carry Southgate’s men through the tournament. But the performances of Vardy, whether as a starter or a substitute when games begin to get stretched, could be just as critical.